‘Barkstone’ is a breathtakingly, wonderful example of Federation Architecture circa 1906.
easy access to the station and schools, including many of Sydney’s top private schools. accommodation totally separate from the main house. Six bedrooms with seven bathrooms and ample parking for several cars. Other features include wide covered return verandas and panoramic city views from the upper floor. private spaces for individual family retreat. A home of timeless elegance, grand proportions and unparalleled living with entertaining at a grand scale ‘Hampstead’ is the ultimate family playground. An entertainer’s haven all year round, the home boasts lifestyle options including a full-size synthetic grass tennis court, indoor heated pool and spa, billiards room, home theatre with wet bar, study, powder room and a walk-in wine cellar. Other features include superb formal and informal reception rooms, a chef’s kitchen with casual meals area opening onto outdoor terrace courtyard, so perfect for morning or afternoon tea. Set amidst manicured grounds and a charming secret garden that’s bathed in northerly sunshine. A large separate family room gazes out over the tennis court, while the billiards room with wet bar on the lower level opens onto the tennis court at one end and the sparkling heated indoor pool also with concertina doors at the other end which then flows onto beautiful garden entertaining grounds outside with paved areas, showcasing grottos and statues. ‘Hampstead’ offers outstanding accommodation with six generous sized bedrooms, six bathrooms (five ensuite) four bedrooms feature built in wardrobes while the main bedroom suite has a dressing room. Quality built and meticulous craftsmanship, this home is of Full brick and concrete construction on all levels. 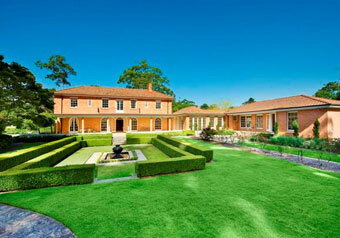 Killara is well renowned for its exquisite homes and peaceful, leafy and family friendly streets. 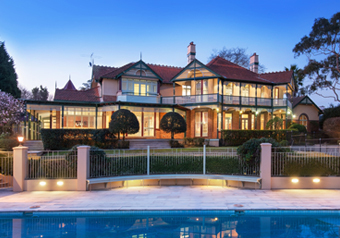 This suburb is also central to the North Shore’s many top State and Private schools including Killara High, Ravenswood, Knox Grammar, Abbotsleigh and Pymble Ladies College to name a few. The added bonus here is the short stroll to the railway station. 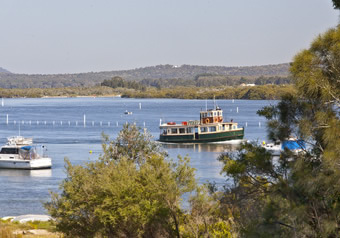 ‘Hampstead’ is also convenient to village shops, cafes, eateries and Chatswood Shopping, dining, and entertainment. Killara offers one of Sydney’s most sought after family lifestyles and is only 25 minutes ‘drive to the CBD. As inviting as it is impressive, ‘Hampstead’ is an enticing and rare offering. Kumdibar (1898) is a breathtakingly beautiful example of early Federation architecture lovingly revived to its former grandeur. 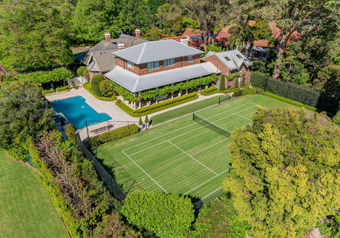 The stately residence is nestled among 2,934m2 (approx) of impeccably manicured formal grounds, complete with a championship sized tennis court and pool. The home contains five bedrooms and three tasteful stone bathrooms, the main with a spa bath, including an expansive master wing encompassing a travertine ensuite and a dressing area.A flexible study on each level could be used as additional accommodation if desired. Kumdibar contains a series of gracious formal and casual entertaining areas for all events, providing plenty of private spaces to which your family can retreat. The grand lounge and dining rooms are warmed by gas fires, while upstairs, a relaxed family area makes the perfect TV room for the children. Adjoining casual living and dining space, the gracious marble gas kitchen lies at the heart of the home, complete with a breakfast bar. Secluded above the double garage, a games room accommodates a king-size billiard table with ease, complete with overhead lighting.Soaring 13 foot ceilings are enhanced by ornate cornices and picture rails, while whitewashed timber-panelled walls, a slate roof and parquet floors are a nod to its heritage. Additional details include a security system, plantation shutters and ducted air conditioning to keep the surroundings temperate year round. Along with a double garage there are two carports with garden storage and a stately circular driveway to accommodate your guests. Elite private schools such as Knox Grammar and Abbotsleigh are within an easy stroll and the local primary school is just one block away.Take a leisurely stroll to charming Wahroonga Village and immerse yourself in the welcoming local culture, or jump on a train and be in the CBD in just 30 minutes. Apply Your Imagination… Two Homes In One! The classical character of the current day property is immediately apparent throughout, whilst the opportunities are endless. Offered to the market for the first time, the property has been lovingly maintained by the same owner since 1958. Surprisingly quiet, the property offers outstanding convenience being a short walk to Killara High School, East Killara Shopping Village, Bus Stop with access to Sydney CBD & Killara Railway Station. Capturing tranquil views over picturesque Myall River, this impeccably presented dual level home offers contemporary luxury with a relaxed holiday-like vibe. Facing north-west and set amid landscaped grounds, it´s configured as two whole-floor residences making it an ideal home plus income prospect or holiday home. With the river at the front of the property and idyllic Jimmy´s Beach just around the corner, its location is a veritable boat and beach lover´s paradise within easy walking distance of golden stretches of sand and just 350m to the boat ramp. - Custom built riverside home offering flexibility of use. - 2 bedroom upstairs home with breathtaking views. - Open living with large deck, select Brush box floors. - State of the art island kitchen, striking vaulted ceilings and cosy fire place. - Private fully screened rear deck housing a 4 person jacuzzi. - Lower level 3 bedroom apartment with master suite. Solar power and fully air conditioned. - Private deck, combined living/dining room and a separate kitchen. - Established child friendly garden with irrigation system. - Large double lock up garage with workbench and wine cellar. 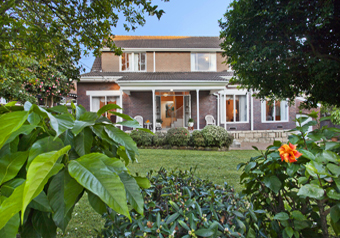 - Close to the village hub, top surf beaches and coastal walks. Displaying wonderful street appeal, this classic family home with white picket fences has been exquisitely refurbished and extended throughout its life and now boasts a versatile floor plan, easily accommodating growing families. Beautifully positioned on a tree-lined street, this fabulous “cottage style” home offers exemplary family living throughout its smartly renovated interiors, all comfortably set on a deep parcel (approx 1,050sqm) of land. The outstanding family friendliness of this quiet location is confirmed by it’s coveted proximity to West Pymble Primary School, Our Lady Of Perpetual Succour Catholic School, Ku-Ring-Gai Fitness & Aquatic Centre, Philip Mall Shopping Precinct and Bicentennial Park - all lifestyle assets that enhance the allure of this beautifully flexible home. This landmark Victorian terrace is positioned on a commanding corner block overlooking Centennial Park with entry from Moncur Street. Located on the fringe of Queen Street village, 3.5km east of the CBD, this unique village residence is foot steps to abundance of retail options. courtyard with auto retractable roof. cosmopolitan shopping strip, Queen Street Boutiques and Westfield. Only 10 minutes drive from North Richmond and situated in 40 Acres of lush rainforest ,this stunning 'sanctuary' is privately positioned in the foothills of the Blue Mountains and yet only 90 minutes drive from the CBD. Helicopter access brings this Haven even closer. Offerings here include natural spring fed water and a spacious convict hewn sandstone residence with Spanish slate roof tiles and return verandas. The home comprises of a lounge with a large open log fireplace, a separate dining room, opening onto a paved courtyard and sparkling rock pool with a waterfall, so ideal for outdoor entertaining. An underground wine cellar, five bedrooms, two bathrooms,(main with ensuite) study, kitchen and family opening onto verandas and gorgeous vista. Past the main home stands a disused tennis court plus a housekeeper's self contained cottage including two bedrooms, a sitting and dining room and bathroom with a flight of king parrots. Even further away there are five self contained holiday cottages built in Settlers' Style design. Four of these with two bedrooms and one with four bedrooms. Featured in 'Home and Away', 'Getaway' and Cosmopolitan shoots, it still offers great potential for further improvement and or future development. 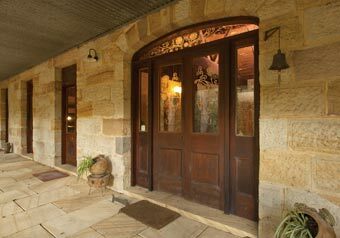 A beautifully secluded country paradise retreat surrounded by a reserve leading down to the Grose River – mountains to climb, caves and creeks to explore or simply sit on your veranda and listen to the sound of silence or be spell bound to the sound of the bell bird as it sings high in the trees as the morning light filters through. A place where you can not only spoil yourself but also your guests and your staff. Situated along an exquisitely private driveway on 2,594 square meters of picturesque gardens with a perfect northerly aspect in the leafy exclusive suburb of Wahroonga with an easy walk to Private and State schools as well as Wahroonga shops and station. 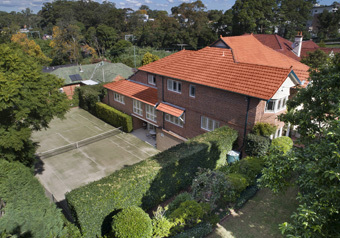 Utterly Private, and of double brick construction, the home has been fastidiously renovated for modern day comforts and easy living offering seamless flow from indoor to outdoor alfresco entertaining, sparkling pool a championship size north/ south tennis court, level lawns and gardens all due north. Offering an entry foyer, formal lounge with fireplace, separate dining room, music room or second sitting room, kitchen with meals area, conservatory, wine cellar, sauna, five bedrooms, main bedroom with ensuite and a balcony, two studies with potential for an extra bedroom and three car lock up garage with parking for several cars in the grounds. The home is also set up for work from home office or separate in-law-accommodation with separate entry. Approached by a driveway winding through magical and tropical garden setting that takes one to another dimension , perfectly positioned amidst secret gardens ,birdsong and palm trees and yet only 40 minutes’ drive approximately to the CBD. Ideally positioned in one of the finest streets of Warrawee in this exclusive suburb of the Upper North Shore and amongst other prestige homes, wonderfully serene and peaceful and yet only a short walk to Warrawee and Wahroonga railway stations, Wahroonga village shops, Private and State schools and other amenities. Superbly rebuilt, and set on the high side of the street, this tri level home of immense proportions offering versatile living and modern comforts. Comprising an entry foyer, formal lounge and separate dining rooms opening onto large balconies overlooking stunning flood light, mature gardens perfect for formal entertaining. Seven bedrooms, five bathrooms, three ensuite, study, computer room, rumpus room, billiard room, huge kitchen and family room flowing onto large paved areas with swimming g pool, north /south full size tennis court and lawns plus a five car lock up garage and a gated entry. 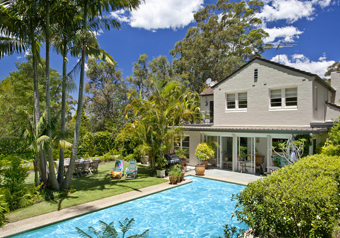 An ability to acquire a unique offering in one of the most notable leafy suburbs of the North Shore and yet only 40 minutes’ drive approximately to the Central Business District. 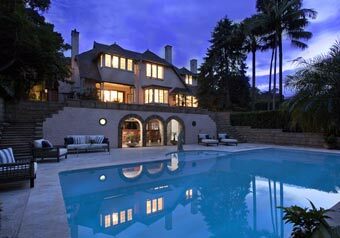 ‘’AMBERLEIGH ‘’ A Magnificent North Shore estate of historic significance designed by reputable architect Glynn Gilling. Situated in one of the finest enclaves of Wahroonga at 30 Billyard Avenue, this residence has a lot to offer including the convenience of walk to train station, Wahroonga village shops plus Knox and Abbotsleigh schools. Fastidiously restored and meticulously maintained and set in park like gardens of 4,800 square metres, designed by its horticulturist owners, the home offer spacious living with large reception rooms opening onto huge level sandstone covered terraces, loggia and manicured gardens facing north encapsulating light, a swimming pool, cabana and tennis court brilliantly created for garden parties. Comprising also of informal living rooms, study, billiard room, cinema room, five double bedrooms, four bathrooms, two powder rooms a sunroom and parking for six cars. 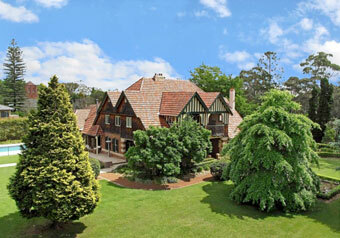 A mansion reminiscent of a country estate and yet only approximately 45 minute's drive to the CBD. A rare offering for the astute buyer to acquire a landmark quality residence. 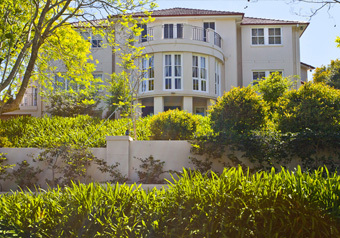 ‘’CRAIGNAIRN’’ one of the North Shore’s notable estates nestled in stunning level 7,100 square metres of established gardens and lily pond. An architectural master piece of immense proportions, wonderfully restored with quality and period finishes with no expense spared, for modern day comforts and living. 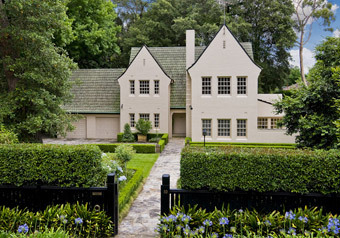 CRAIGNAIRN built around 1909 depicts extraordinary characteristics of a bygone Federation and Edwardian era set amongst other superb estates of its time in one of Wahroonga’s premier streets and yet only a short walk to Station, Wahroonga village and Knox and Abbotsleigh Private schools. Comprising enormously high ceilings, elegant double entry foyer, formal living room, library, banquet dining room, billiard room, home cinema, gigantic Kitchen and family room all opening on to 'Raffles Hotel' style large covered return verandas and rolling lawns, cabana, tennis court and swimming pool. Six double bedrooms, four bathrooms, main bedroom with dressing room and ensuite, several fireplaces, parking for five cars and a separate guest house complete with all the trimmings. Secure gated entry. 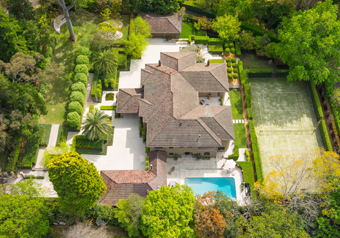 A unique opportunity to acquire one of Wahroonga's landmark estates and yet only approximately 45 minutes' drive to the CBD. 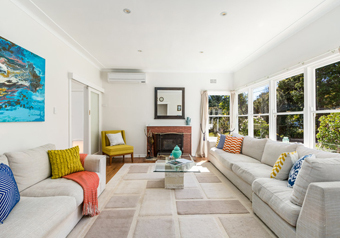 Positioned in one of Killara’s most coveted locations with further potential to capitalise on your investment. A short walk to Killara Railway Station, ovals, parks and easy access to Private and State Schools. First time offered in seventeen years this home comes with a tennis court and pool, formal lounge, separate dining room, kitchen and casual dining area flowing on to rear garden, tennis court and pool. 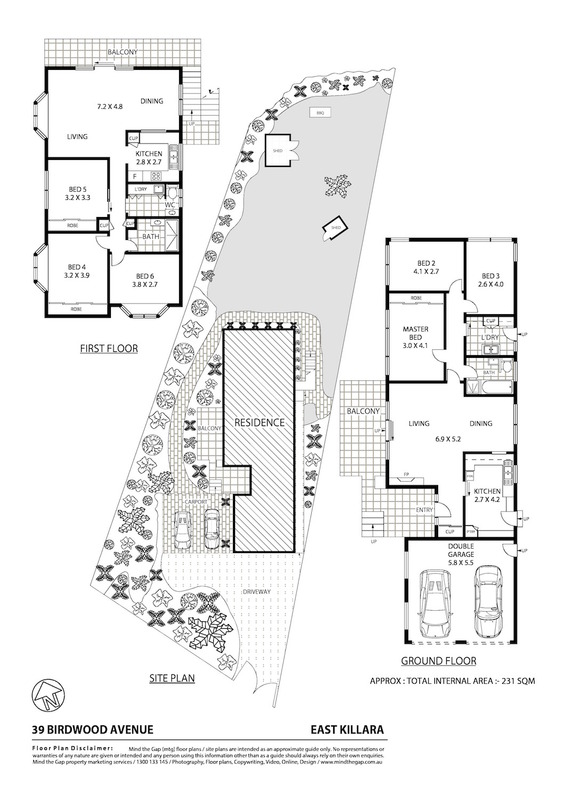 There is also a family room, games room, two studies, five bedrooms, four bathrooms with Master ensuite and dressing room. Separate studio and three car garaging with auto doors. Providing a unique opportunity to acquire a family home with the ability to redesign or rebuild in the future. 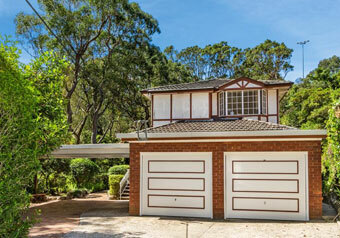 25 minutes approximately to the CBD and 4km to Chatswood shopping centre. A landmark property of historic significance, situated in one of the finest streets of the leafy North Shore suburb of Warrawee and yet only approximately 40 minutes drive to the CBD. Built around 1913 and positioned at the end of a gravel driveway, exemplifying architectural mastery by renowned architect BJ Waterhouse, who also designed 'Tulkiyan' and 'Nutcote'- the home of author May Gibbs. Blending timeless elegance and splendid seclusion, the home sprawls amidst birdsong, northerly sun and exquisite gardens. Blissfully quiet and utterly private, the residence has been fastidiously renovated for modern day comforts. 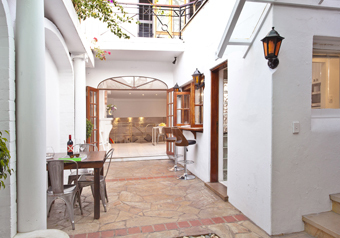 Short walk to station, private schools and shops. • European kitchen and family living with casual dining opening onto a sun drenched courtyard..
• Butler's pantry, double lock up garages, auto doors, gated entry and multiple guest parking in the grounds.